PICTURE PERFECT: The place was clean, comfortable and right on the beach as described. Shopping and dining is within a short distance. We couldnt have asked for a better place to stay and we will most certainly come back. Thanks again yall! Great place Had everything we wanted and needed. We enjoyed the pool, gym, and extra large bath. Was great having a kitchen as well. We were very pleased with working with Geoffrey. Every question, email, call was answered quickly. We loved staying in this unit. There were 4 of us, my husband, myself and our 2 teenage daughters. We loved the view from the 21st floor! Very short walk to beach area, so no complaints. 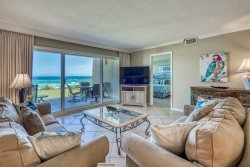 I would highly recommend this unit to anyone wanting to visit the Destin area. This Texas family made lots of memories here!